Last weekend a buddy invited me to play golf at a nearby course we both enjoy. It’s not especially long nor tight and has relatively few acres of sand and water but the main attraction without a doubt was spending time with a friend. As we walked off the range following our pre-game warmup, he suddenly stopped saying, “Oh nuts!” Thinking he might have left something important like a club or his golf swing back in the car I was in for a surprise. Now to explain so you don’t think my friend has completely lost his senses, he has been playing golf for several years, though at times finds it hard to get out…just like the rest of us. He is dedicated, wants to get better and has the advantage of having above average athletic ability. However, having said all that, his chances of integrating a one iron into his game are between slim and none with the needle nudging the latter. But in his mind’s eye he sees himself ripping it 220-yards into the wind with a slight draw that lands on the green, checks and rolls next to the pin. Really? 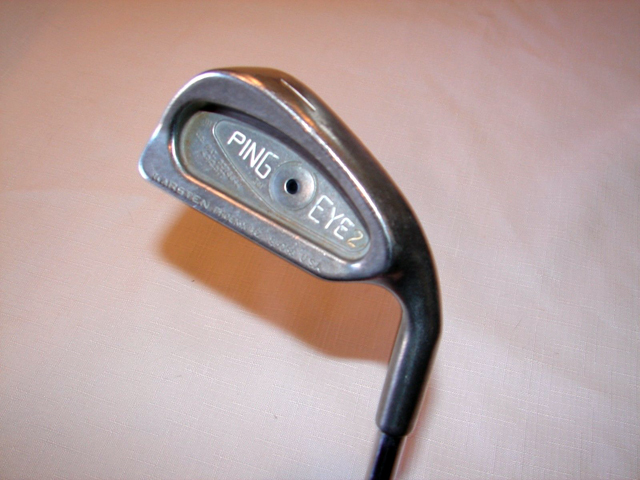 The story of how he came by the Ping Eye2 1-iron (a model which first saw the light of day in 1982) is worth the retelling. The week before my friend had been playing with a couple of guys, one of who wasn’t very good and had a bad case of the “Tommy Bolt’s,” or club tossing. Unbelievably this fellow was carrying a 1-iron in his bag and with a game even less accomplished than my friend’s had a particular affection for heaving it after nearly every swing. Anyway back to the 1-iron saga, between tosses the fellow was ranting he was going to dump his 1-iron. Sell it. Good riddance. “Done!” was the reply and my friend was the owner of a 1-iron. After my friend proudly related his tale I pointed out aside from the putter the 1-iron was probably the cause for more people giving up the game than anything but a spouse that doesn’t play. And that it was primary contributor to invention of hybrids. For crying out loud, not even PGA Tour players carry them. Histo rically there are a number of famous 1-iron shots. Ben Hogan’s MacGregor 1-iron to the 72nd green of the 1950 U.S. Open setting up a par to put him a playoff the next day which he won. This all coming after being almost killed in a head on crash with a bus 16 months previously. 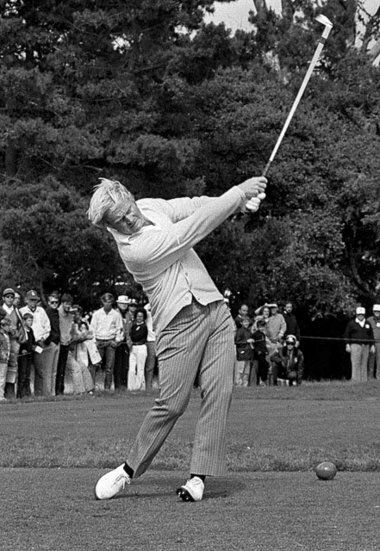 Jack Nicklaus in the U.S. Open back in 1972 at Pebble Beach playing the par-3 17th on the final day. The 219-yards between the Golden Bear and the hole were dead into a strong wind coming off the local water hazard known as the Pacific Ocean. His 1-iron shot hit the pin and dropped next to the hole for an easy two. Even more incredible to my mind and showing Nicklaus’ immense talent was on the back swing he felt the club was too closed which would have produced a disastrous hook. However, he had so much control that week he adjusted on the way down holding off the release to compensate. 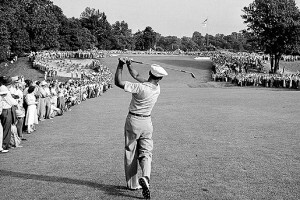 The result was his second major championship of the year. My own 1-iron story goes back to the middle 70’s when I was a lot younger and thought I could play this maddening game. Par-5, dogleg left and after a good drive to the corner a sweet 1-iron into the hole for a two—double eagle—albatross—whatever. The unfortunate part of the story is, because of the way the green-fronting bunker was situated, I couldn’t see it go in. But back to the present. When we got out on the course my friend tried out his Ping Eye2 “butter knife” from the tee on two holes of the second nine. As you might expect the results weren’t pretty. But he has vowed to keep at it because he can still see that 220-yard shot into the wind with a slight draw.